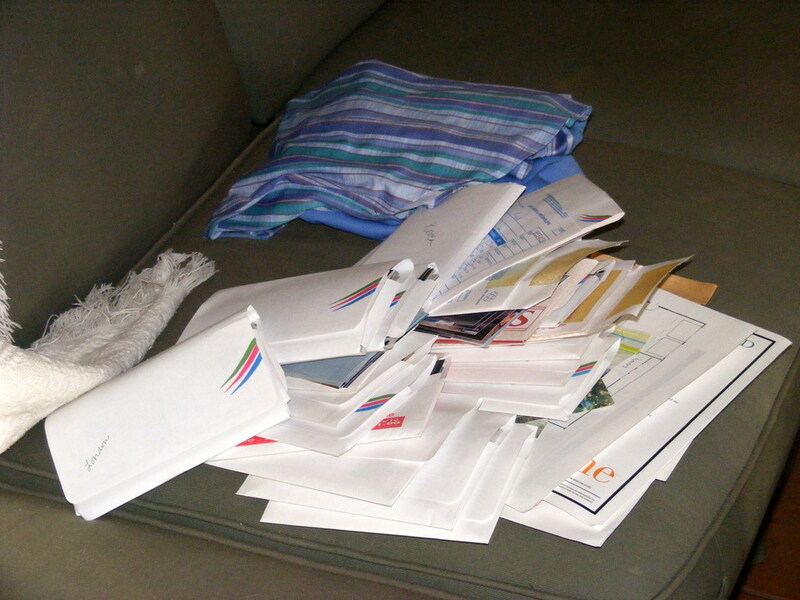 Cindy’s Weekly Wisdom ~ Preserving Memories or Creating Clutter? We just passed Thanksgiving (in the US) and are coming up on Christmas and Hanukkah, and I am willing to guess that December is the most heavily photographed month of the year. Well, last month, I spend an hour sorting through a huge box of photos and memorabilia. There were packets of organized photos from my college years, but beginning with my wedding (1997), nothing was organized, culled, etc. What a miserable experience! "The photos that survived this culling and an outfit that was in box that belong to my Grandmother Clara." If you don’t sort through your photos when you get them, it will not get easier 14 years later. If you don’t label your photos, it will not get easier 14 years later. If you’re not motivated to put your photos in albums now, you won’t be any more motivated in 14 years. You will wonder why in the world you took certain photos. Did they once mean something to you? You may experience a sharp, sad feeling of regret when you come across a lovely photo of yourself and someone who is no longer a part of your life. Your digital camera takes far better pictures than your film camera ever did. What in the world was the point of getting every photo printed in duplicate? I will use my delete button much, much more. I will transfer my photos into Picasa and label them when I download them, deleting more as necessary. I will remember that just because I can take photos of every conceivable moment of an event, that doesn’t mean I should. I will leave my camera at home at times so that I can fully appreciate the event with all my senses, not just through the lens of a camera. I will take fewer photos of things and more photos of people. I hope you have a great holiday season and that you use common sense with your camera. Remember, each photo you take is one that you have to process in some way. If you don’t, instead of preserving memories, you’re just creating clutter. "The photos still to be sorted and more than 2 pounds of photos that went into the trash. These were mostly duplicates, lousy shots, and photos of people I did not (or did not want) to remember." I had another sweep through our paper files and found more out of date paper clutter. This is a task that requires attention on a regular basis. Last year, as a thank you gift, a friend gave me a blueberry bush. She knows I hate clutter so she gave me something lovely for the garden. Earlier in the season I replanted it into a lovely big pot I had picked up off the side of the road. I am so excited that is has grown so beautifully in its new location and I harvested my first crop this week. So, it was only two blueberries but they were juicy, sweet and delicious and I am expecting greater things from it next year. Thanks Jen for my lovely plant I am really enjoying watching it grow. As a Consultant for Creative Memories, I work with lots of people who have boxes, bags, bundles, and drawers full of photos and memorabilia. It is amazing how many photos we throw away because they are not meaningful — and as you experienced, many years have faded the memory of who and what the pictures are about. You’ve given some great ideas on preventing this. We have a wonderful organizing system for photos. And the Creative Memories software program, “Memory Manager,” is the very best for organizing and editing photos. Much easier than Picasa or Photo Shop. Check it out at your consultant’s website – or mine! does your software have face recognition capabilities. That is one of the things I love about Picasa. Being a Creative Memories consultant I was wondering what you thought of Cindy putting her photos in snap-lock bags. I cringed at this because I am almost certain that this is not an acid free environment and therefore not good for her photos. For some reason your message has snuck through the system without alerting me to the fact that you are new here Shirley, but I am not going to be bested by a little computer, I know you haven’t commented before. So let me say welcome to 365 Less Things and thank you for dropping in to say hello. I took a quick look at your web site and was excited to see you are from Washington, lucky you! I will be there next April and am so exciting to visit all my old haunts and my old friends. Yes, this is my first comment, but I’ve followed your blog for a few months, after a recommendation from a customer. You’ve been very helpful to me! Our software does not have face recognition. It’s great for organizing photos, though. You can check it out at my website. The software is “Memory Manager.” There’s a demo video on the website. All right you two. I KNEW someone would say something about my bags. Perhaps surprisingly, the pictures in them seem OK. WAY preferable to the “system” I used before (brace yourselves): Construction paper folders!! The reason she snuck through wihout you seeing it Colleen, is because she I approved it, probably while you were asleep. I thought you would have the same thoughts as me about the photos in Snaplock Bags. I like the dentist story, how very true. You might not feel the same way about your pictures from Greece, but I considered throwing away 95% of the photos I took in Germany, Austria, and the Czech Repulic. If they’d all been lost, I’m not sure I’d be that sad. Thanks Cindy – what a great post! I’m so pleased I’ve put all mum and dads (ie my nuclear family’s) photos in two photos boxes (aside from those mum put in albums back in the day!). It’s nice to have them safely stored. I did a few months ago have sundays where I’d get mum and dad help me cull more, and identify more. I think with school holidays, I might be able to get mum to do a few more, with me beside her. Sadly, as offshoot of your ‘learnings’ is that in many ways I take less photos. I used to take photos of nice flowers, or houses or whatever took my fancy (and pay for printing! 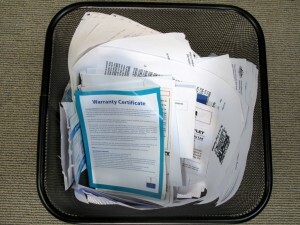 ), but now I think – where do I store these – why would I store these? I have a shoe box awaiting my next cull before I move. I think I thought I’d need these photos to decorate, but for a girl of 25, I have far more ‘art’ or hang-able wall decoration than people twice my age it sometimes seems (from what I see on crafting blogs/pinterest), so I can stop with the arty photos, seeing i have no use for them, and there’s really no ‘joy’ in them! You’ve hit upon the typical problem of taking lots of photos, which is that the majority of them sit somewhere – digital or printed – and are rarely or never looked at again. So true! I have albums all made up, until about 12 years ago, plus packets of photos, boxes of photos, cds of digital photos, a camera and computer nearly loaded with digital photos (a couple of deep shelves-worth in a bookcase in the study, and a pile nearby), and I really AM going to sort them all, thin them down, and album them all (with captions), I really am – SOME DAY. Oh dear, the intention and desire are all there, but it has become such a huge task …..
Now, that blueberry gift and those two berries really ARE something to be grateful for! Sorry, that’s “Oh Cindy” of course. It IS a labor, Ann, no doubt about it. I bought a coupon for three photo books to try and force myself to get the most recent three years corralled in albums. Hopefully, I did not waste my money. Cindy, being a scrapbooker I can only say GREAT POST. Even if you scrapbook pictures you can’t (or shouldn’t scrapbook them all). At least I don’t think so. I have become much more selective about what I take a photo of and how many photos I take of it. I’m also finding that if there is something that is a tradition each year I don’t take pictures of it every year unless something changes (different people, different venue, etc). Colleen, enjoy your blueberries. I love having things I can grow. Ironic, Deb J, I like to have the pictures of the repeated events. I like seeing how everyone has changed from year-to-year. However, I just want one group photo, not twenty photos of the event. I don’t mind one of two photos but I have friends that take over 100 for each event and then think they have to scrapbook them. If people have changed a lot then get them into a few photos and that’s enough for me. I have some friends that will take 20+ photos of their child on one day and then try to scrapbook or display them. Unless they are doing something really unusual I don’t think you need that many. Our church has an event on Halloween for the neighborhood around the school where we meet. We use the same games, etc. So if I take pictures I want them to be of the our volunteers in their costumes because they change every year. I will scrap it on one two-page spread. I don’t need pictures of every game, person, the crowds, or whatever and then another smaller scrapbook of the event. Just my personal preference. I am really good about decluttering my home with the exception of photos. I have ignored them for years. I just don’t want to deal with them. I started albums, but it took so much time and money to scrapbook. I guess I will just wait until the kids grow up and send their stuff off with them to organize! I need to put some updated photos in our home. With digital photos, etc. it is easy to forget to keep up the photos around our home. Your post just may motivate me to do something with the pictures this Christmas break! Good. I hope you have luck with that. I think we Moms plan on doing things over breaks (Christmas, summer) when we probably should plan to do those things when the kids are in school. However, the children might want to help you, and my youngest is very happy to scrapbook for herself any photos that I cull. Great post, Cindy! I’ve been going through my bedroom closet recently and came across a big ol’ box of photos dating back to my high school days. SO disorganized! And don’t get me started on how many photos I have on my computer! I love your “I will”s — they’ve motivated me to take more care with my photos. It’s a battle Josh. I’m working on a photo calendar for 2012, and this will be the third year I’ve made them. At the end of the year, I throw them into the kids’ memory boxes. Sometimes I think that’s enough saved photos for one year. I love the choice of your birthday present! It’s one that will keep on giving and it’s in a pot so if you move, it can move with you. As one who has soooo many photos sitting in sooooo many boxes just waiting for me to do something with them, I love and need this post. Cindy, I totally agree with you on not needing to keep most of the photos. And those duplicates? I’ve found as many as FOUR copies of the SAME photo in my parents’ and grandparents’ boxes. Sigh. I just need more hours in my day and I’d finish up those photos! Have you any siblings or cousins who would like a copy. I so value some photos that were passed over to me, when my grandmother died. My uncle had the albums and allowed me to get photocopies of some, and gave me some others that either they didn’t want, or had other copies of. To them = rubbish, to me = treasure. Oh Willow, it makes me shudder to think about it, although Ann’s suggestion below is a good one. I just finished decluttering all the photos I had that weren’t in albums. There was a lot of garbage. I am happy to report that I am almost done scrapbooking all of my photos (the ones that I wanted to scrapbook anyways). 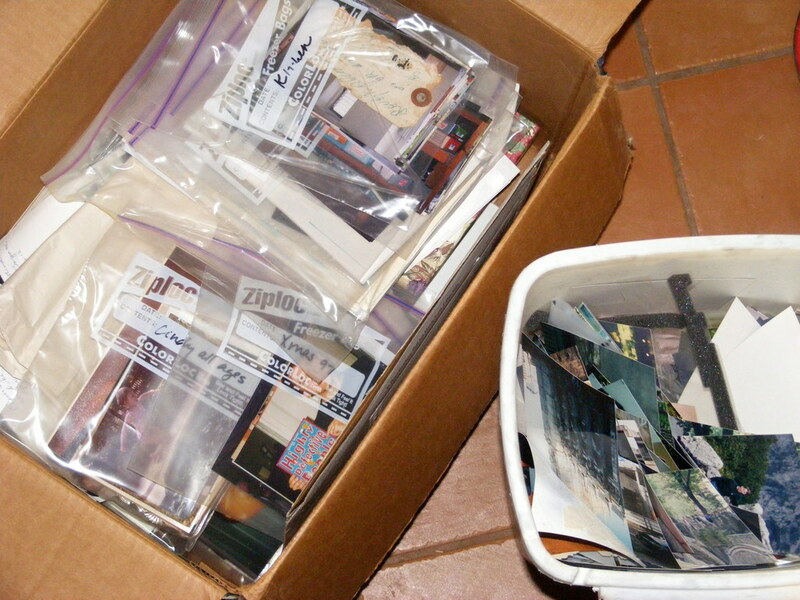 My next photo project-declutter all the old photo albums and consolidate. By the end of the year! That’s my goal. Then ALL photos will be decluttered and almost all scrapbook stuff given away. Yippee! Wow Bree, you’re going to be the envy of every reader! My photos are almost under control. I started scrapbooking (with Creative memories- excellent products) 16 years ago, and am usually close to up to date with my photos. So they’re a pleasure and not a chore to work on. But…(isn’t there always a but!) the ‘leftovers’ have piled up. I’m making a personal album for each of my children with them, and the plan is to scan everything and negatives onto disc and get rid of the actual extra pictures after that. Gasp! When I was young, pictures were so special you would never think of throwing them away. Time for that attitude to leave. I have up to 1989 on disc now, and it feels great to have everything in one little box. 1990, here I come! Fantastic Sabine! It sounds like you’re making steady and consistent progress. Onward!